Totally bitchin' & gnarly, dude. Sunday's 14 miles with Kerrie and Alma was spectacular. It was overcast, slightly chilly, and the air was crisp. Sure, there was the occasional sunbreak here and there, but it didn't rain once. Sa-weet! Win! 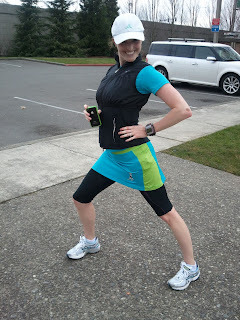 The trail had its fair share of runners, walkers and cyclists, mainly dressed in all-ninja-black...so Kerrie, Alma and I stood out a bit with our clothing color choices: blue, pink and some hot green thrown in for good measure. Unfortunately we didn't get a pic with Alma at the start, as she only went out 5 miles with us. This was my longest run since having the Goob, and I must be honest, I was a little nervous! 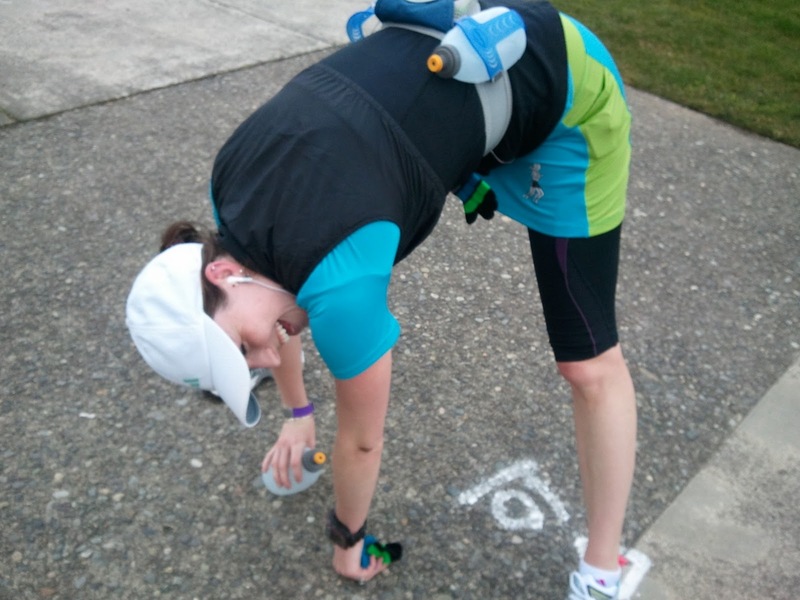 Last week's 12 miles had me panting and ravenous at the end, and so I was a little worried my stomach would eat me alive if I didn't refuel properly throughout this run. GAH! Of course, this is where I need to improve: refueling. My watermelon GU Chomps held me over for the first 7 miles, but I seriously started fading at mile 11. Uber fail. You know my energy level would be much higher if I had drank that Tiger's blood prior to meeting up with Kerrie & Alma....notes for next time. Kerrie and I asked ourselves one particularly interesting question: do other runners take us seriously when we are dressed in our pink/blue/green skirts and running gear? All the other Sunday AM exercise enthusiasts were donning the standard black and white apparel. Did they think that we were merely running a mile or two? We were curious. If you saw us running, would you have thought we were out for 14 miles? We only stopped once at the 7 mile mark for a photo-op, some stretching and some refueling. The other pictures were taken post-run in our noodle-legged delirium. 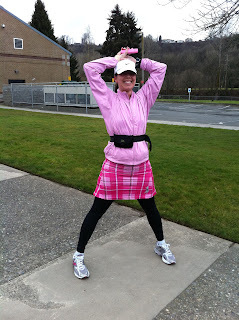 Overall, Kerrie and I were totally "bi-winners:" for outfit choice and running length! Ha! *No, not really. That's a Sheen quote reference. Puh-leeze. You look like you are having so much fun who cares if anyone takes you seriously! Banging 14 mile runs and finishing them - that’s how you roll. Loving the Sheen references. Everybody needs some "Tiger Blood" before big runs. I love your skirts but that is all I wear. I think that people take me seriously because they see me all over town. The only time people laugh is if I am sporting knee socks too. as far as refueling...I don't usually start until about mile 4 on big runs and I have always used hammer gel although now I carry a granola bar and break it up if it is a really big run. The gels made me super sick at my marathon. I also use Nuun instead of water. Good luck it seems like you are getting some awesome runs in. "Winner, Winner, Charlie dinner!" That was his quote last night! To ME, you look like a sensible girl out for 14 miles. Why be dull? Dress for the part ~ and the part demands a good skirt. As long as you said HI back to us as we ran past...I'd just think..RUNNERS. All my winter stuff is boring..I can't wait to be able to bust out the fun summer run stuff I have. My average human brain can't even comprehend anything about Sheen....so sad. I think I would think you were out for a 2 mile stroll with fuel belts on and I would be like, "hey, what time is the spa appointment? And where are we going for coffee?" And then you guys would yell back at me, "Don't mess with the colorful ninjas! Wanna race?" and I'd be like "Yeah! Let's do it!" And you would be like "OK, we have 3 miles left until we finish our 14 miles... meet you at the bike rack in 21 minutes!" And then i would all be doing the math in my head like, 3 miles to 14 miles see me in 21 minutes???? DANG!!!!! That's 7 min miles after going 11 already? "Shooot! I'll be there!!" Then I would run my 9 min miles to the car and jet!!! I would never return to that trail on that day again because I would be scurd of the Colorful Ninjas! In other words, yes, I bet people took you seriously! you're so back in action you new mom! 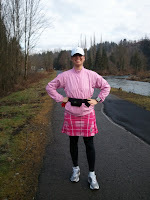 There were a few skirts on the trails Saturday but most of them were black only a few were colorful, one guy in rainbow checkers tights, one guy with no hair on his hair but a moses beard on his face...it takes all kinds. 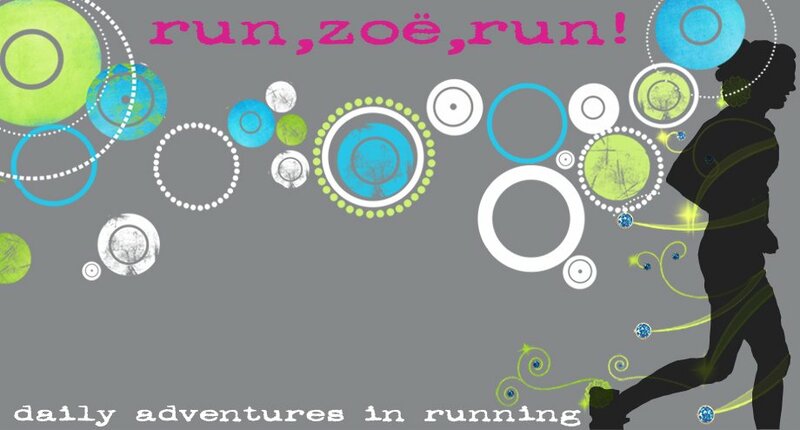 I say run in what makes you love it the most! You both looked like serious runners to me! 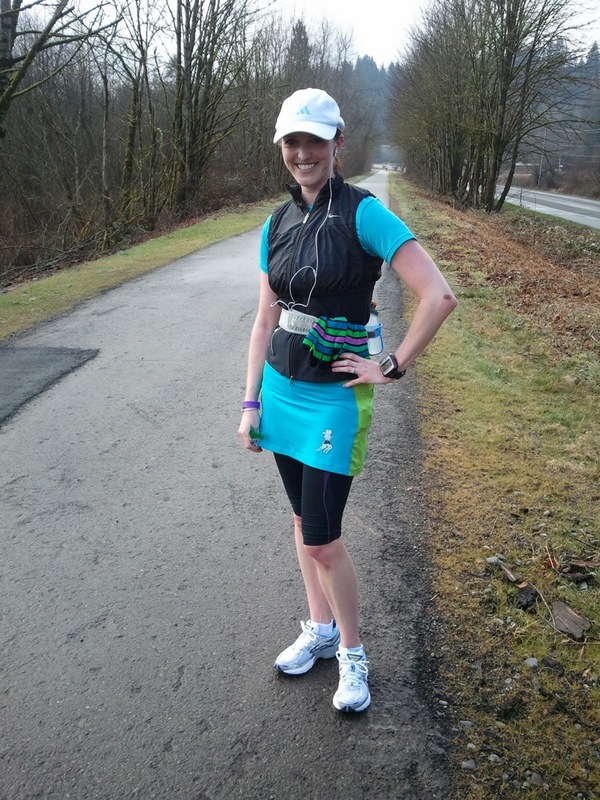 AWESOME 14-miler and you looked great doing it! You chicas make 14 miles look VERY stylish!! One day I hope to make it to the west side for a run with you all!! But, I don't think my outfit will compete! I'm dying at Amanda's comment! I hope I can look as styling as you two on my 15 miler Friday. This will be the furthest I have ever gone. Yikes! Haha. Such a great role model/parent banging rocks. Hahaha. (I know you are kidding don't worry). Nice job on the 14! LOVE THIS!! Sooo funny.. I had no idea that you had a tough time on our 12 miler you seemed so strong. I think you two look super CUTE!! Good work..